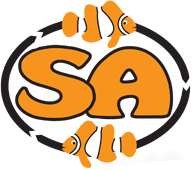 The SA Black – Midnight Designer Clownfish is a variant of the Orange Ocellaris Clownfish. The SA Black – Midnight Clownfish is often solid black color and can have an orange face. This Black Ocellaris variant is most often found in Northern Australia from Darwin towards the West. Like most Clownfish, the Midnight can become territorial, but is usually peaceful inside its territory.